I love reading Christmas books yes I know its September but you can ignore that small detail. Because this book is absolutely fantastic I just adored it from start to finish and as normal I can highly recommend it. 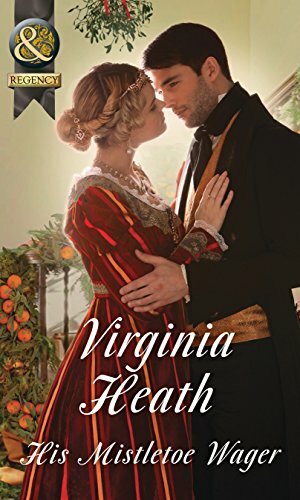 This book had it all as normal Virginia had the humour, we also had the baddie and then at the end Virginia had me in tears but they were happy ones. I just adored Hal he may have rakish ways but god how I loved him, and I would have adored having a uncle like him who wasn't afraid of playing with children especially little girls, like his two nieces which he calls them hellions-in-training or as their mother calls them Prudence and Grace. There is nothing more that Hal likes doing and that is having wagers with his brother-in-law Aaron, who by the way is married to Connie Hal's sister. This particular Christmas Hal is the new Earl of Redbridge and is not looking forward to the festive season because between now and Twelfth night he is expected to attend all of the functions, because apparently it was a Redbridge tradition and one his mother was determined to continue, and so because Hal loves his mother he couldn't bring himself to complain and on Twefth night he has to host the most opulent and eagerly anticipated ball. I digressed right back to Hal and the wager. Hal is at the Renshaw ball when Aaron finds him outside with a sprig of mistletoe with five berries, and comes up with a very interesting wager were the looser mucks out the other's stables single-handed, so I hear you cry what is the wager, alright I'm getting there. The wager is five berries equal five kisses, each one has to be in a different location and all five before Twelfth Night. Hal at this point is very confident that he will get all five kisses with no problems, until Aaron says the full terms, which is he gets to choose who Hal has to kiss, Hal agrees to the terms and Aaron with mischief in his eyes spots the young lady he has chosen. The solitary figure of Lady Elizabeth Wilding or Sullen Lizzie, because apparently she loathes all men or does she. Now we come to the lovely Lizzie, I will not call her sullen because she isn't. I adore her I want to be her best friend, because of what happened five years ago. I found Lizzie to be courageous and she has such a caring heart and she also so strong well you would be when to society they believe and Hal is included with this, they believe she callously called off her wedding on the day she should have married The Marquis of Rainham. Well that's what society thinks in actual fact it was Rainham that jilted Lizzie at the alter and left her something that no one in society knows of or so she thinks and that is her son Georgie. Right from here I'm not revelling anything more just that watch out for The Earl of Ockenden who apparently has bad breath that can singe eyebrows off, that really does make me shudder. Also the Rainham makes appearance but he just spineless and Lizzie and Georgie are better off without him. There is one other person who I loved that is Stevens Lizzie butler and bodyguard, I did find him funny especially when he won't let Hal enter Lizzie's home. But Hal finds a way round that by climbing the wisteria much to Stevens annoyance, and that my friends is were I will end. I can here you now we want to know about the wisteria. Well you are going to have to buy the book and find for yourselves. Virginia I adored this book you have surpassed yourself. without a doubt I give this book 5/5 stars, I would give more but I can't.